The more adventurous photographers have always been fascinated with the abstract in photography-- infrared, diffusion discs, duo toning, to name a few. Among the most memorable abstractions are equidensity images - partial negative and partial positive, often with bold contrast, vivid geometric patterns, and contour lines around objects. 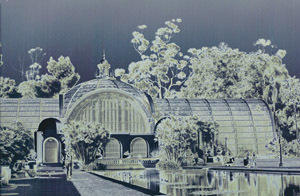 Up to now three popular approaches to equidensity production were Sabatier "pseudosolarization", the no-longer produced Agfacontour film, and bas relief, with the first named being the most widely employed. Unfortunately, because of problems with uniform second exposure, the Sabatier effect is difficult to apply to normal lengths of roll film. 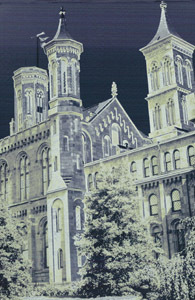 In contrast to the above techniques, "chemical solarization" is quite suited to roll film given instantaneous outdoor exposure in a camera. Furthermore, because a copying step is not required, image sharpness does not suffer, and dust spots from printing are not a consideration. In brief outline, the chemistry involved in "chemical solarization", based upon the Waterhouse effect (1890), is as follows. When exposed film is first placed in the patent developer, which contains 2-chlorohydroquinone and 1-allyl-2-thiourea, heavily to moderately exposed film areas quickly (two minutes) give density via direct development to produce a violet-blue negative image. This deposited silver color may be due either to particle size, or to etching of surface. During this time, in unexposed film areas, 1-allyl-2-thiourea complexes are formed with silver bromide, both on the surface of crystals, and in solution via dissolution of crystals. At about two minutes, the complex on the crystal surfaces begins to decompose to produce specks of silver sulfide, which can act as development centers. On these centers developing agent reduces silver bromide-1-allyl-2-thiourea complex from solution (solution physical development) to give a finely divided brown positive silver image. In areas with only light exposure, the trace amount of direct development liberates sufficient bromide ion to inhibit silver sulfide formation and subsequent solution physical development, thus giving minimum density. Consequently, one obtains a trough-shaped (in cross section) D log E curve. In addition, bromide ion from negative areas diffuses a short distance to bordering positive areas, inhibiting solution physical development, and resulting in clear, narrow contour lines around various image objects. By contrast, contour lines with the Sabatier effect, which are usually thicker, are the result of an illumination gradient for curved surfaces. With regard to suitable film for this effect, it has been found that thin emulsion, high resolution films, such as Kodak Technical Pan, have sufficiently high contrast and speed to give excellent results. 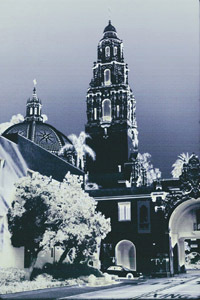 With this film, and the developer described below, a typical sunlit outdoor exposure is 1/125 sec. at f4.9. 2-chlorohydroquinone in practical grade, which contains small, but necessary amounts (5-10%) of dichlorohydroquinones present as impurities. Apparently, this mixture gives the "right" ratio of direct development to solution physical development. Because of this complex reaction scheme, pH control is crucial and should be halfway (10.20) between values for start of silver sulfide formation (10.10) and excess fog formation (10.30). It has also been determined that 1-allyl-2-thiourea gives better positive gradation than does thiourea. * The exact amount of boric acid to give an aim point pH of 10.20 must be determined initially by test on a given batch of chemicals, either with a suitable pH meter, or by use of exposed film test strips. If overly dense slides result, because of relatively high dichlorohydroquinone concentrations, either pH should be lowered somewhat, or air ageing of a partially filled bottle of developer for 48 hours (to lower dichlorohydroquinone concentration) should be utilized. Further details regarding use of this developer are found in US patent 6,083,671, Developer for Direct Production of Equidensity Images on a High Contrast Film - July 4, 2000. A copy may be downloaded from the Patent Office as https://www:uspto.gov. With the above developer and Tech Pan, development is for 5.0 minutes at 20 degrees C (68 F), with agitation at 30 second intervals. Conditions should be as closely adhered to as possible. Subsequent treatment involves stop bath, fixer, wash, and wetting agent rinse, followed by sponging to remove surface silver deposit. Typical landscape renditions are as follows: Objects with high luminosity or reflectivity such as sky, clouds, marble buildings or monuments , give medium to dark violet-blue tones. Subjects of relatively low reflectivity, including dark bronze statues, foliage, asphalt or dark roof shingles, give medium brown shades. Dark shadow areas reproduce as olive-black, while objects having about 10% reflectivity, such as aged granite, weathered wood, and certain bodies of water, give grayish tones of relatively low density (equidensity). This article is copyright 2002 by Harvey W. Yurow. All rights reserved--may not be reproduced in any form without the express permission of the author.